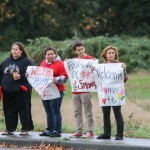 MARYSVILLE — A community event is planned for the one-year milestone of the shootings at Marysville Pilchuck High School. The event, called A Walk of Strength, will start at 9 a.m. Oct. 24 and will include a walk around the campus. The plan includes inviting people to plant red and white tulip bulbs as they “come together and reflect,” according to a news release. The details are being coordinated by the city, the school district and the Tulalip Tribes. The walk is meant to be a safe and supportive way to remember together, Mayor Jon Nehring said. Tribal Chairman Mel Sheldon described each step as a symbol for healing and moving forward. 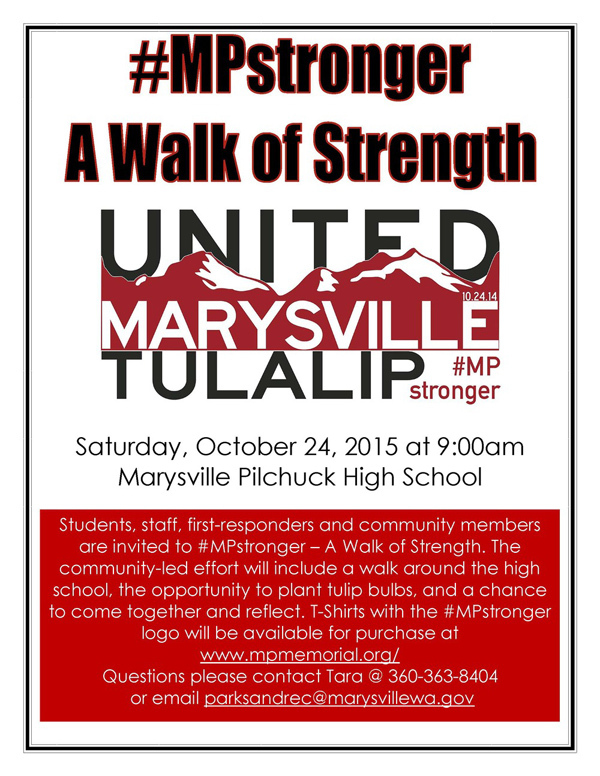 T-shirts with the logo and “#MPstronger” branding are expected to go on sale at www.mpmemorial.org. Oct. 24 will mark one year since a freshman at Marysville Pilchuck High School invited a group of friends to sit together in the main cafeteria. He shot five of them, four of whom were fatally wounded. He then took his own life. The father of the teen who killed four classmates at Marysville-Pilchuck High School last fall was convicted Tuesday of illegally possessing a half-dozen firearms, including the one his son used in the shooting. Raymond Lee Fryberg Jr. was convicted of six counts of unlawful possession of a firearm. One of the firearms, a .40-caliber Beretta pistol, was used by 15-year-old Jaylen Fryberg to kill four classmates and wound a fifth. Jaylen then killed himself with the same handgun. The federal jury deliberated for about a day after a three-day trial before U.S. District Judge James Robart. The senior Fryberg appeared stunned by the verdict. He had tears on his cheeks as he huddled with his attorneys and family after the verdict was read. Fryberg will remain free until sentencing, which is scheduled for Jan. 11. He faces up to 10 years in prison for each count. Family members of some of the shooting victims sat behind the prosecutors when the verdict was read. They declined to comment as they walked in silence into an elevator on the 14th floor of the U.S. District Courthouse. After the doors slid shut, however, ebullient yells and whoops could be heard. Fryberg’s Seattle attorney, John Henry Browne, said the criminal charges were retaliation for the school killings and had been “pushed by the families” of the victims. While the school shooting was never mentioned during the trial, Browne said it hung over the proceedings like a pall. “It was difficult to stay on task,” he said outside the federal courthouse. While the sole issue was whether Fryberg knew he was barred from owning firearms, Browne said, prosecutors began their closing arguments Monday with a slideshow of the six firearms Fryberg had purchased, including the handgun used by his son. “This was clearly piling on by the government,” said Browne, who intends to appeal the verdict. 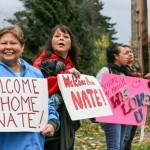 A grand jury had alleged the senior Fryberg, a member of the Tulalip Tribes, purchased a number of firearms despite being the subject of a tribal domestic-violence protective order that had been issued in 2002. Fryberg, 42, pleaded no contest in tribal court to violating the order in 2012, according to federal prosecutors. The government says that should have prevented him from purchasing firearms, but that flaws in the instant-background-check system allowed him to “slip under the screen” of several law-enforcement databases. Prosecutors claimed Fryberg lied when he filled out firearms-purchase forms on which he declared, under penalty of perjury, that he had not been convicted of a domestic-violence crime. During the trial’s closing arguments, Browne accused the government of appealing to the jury’s emotions by showing photographs of each of the six firearms — including the handgun used in the school shootings and two assault-style semi-automatic rifles — that Fryberg had purchased at the Cabela’s store in Tulalip after 2012. Fryberg, Browne said, assumed the purchases were legal and pointed out that he was even able to obtain a concealed-carry permit for a handgun, which requires a more stringent background check than purchasing a firearm. Browne said Fryberg was never properly served with the protection order, and that there were questions about whether the order was ever filed with the court. The police officer who was supposed to file it — who was the brother-in-law of Fryberg’s ex-girlfriend, who had sought the order — is dead. Fryberg claimed he was never given a copy of the order and did not know it existed, despite his no-contest plea in 2012. Assistant U.S. Attorney Ye-Ting Woo said the issue was not whether Fryberg was able to purchase the guns because of “gaps in the system,” including the fact that tribal-court domestic-violence protective orders and convictions often are not entered into national databases. “The system relies on the purchasers to tell the truth,” she said. The investigation into Fryberg’s gun ownership began in October 2014, when the FBI was trying to determine ownership of the gun that was used in the school shootings. 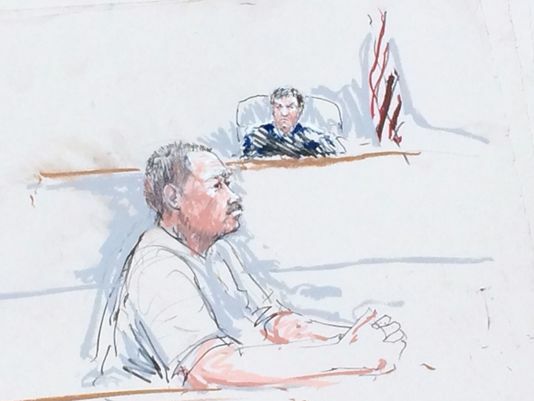 The senior Fryberg had purchased that gun from Cabela’s in January 2013, a year after a permanent protective order against him had been filed in Tulalip Tribal Court, prosecutors said. A search warrant filed in U.S. District Court stated that agents found several firearms lying unsecured in the home. A 1,400-page report detailing the investigation into the school shooting said Jaylen Fryberg apparently brought the handgun to school in a backpack. He texted several friends to meet him in the lunchroom that day, Oct. 24, and also sent a text to his father and other family members detailing his funeral plans. Minutes later in the cafeteria, Jaylen Fryberg pulled out the Beretta handgun from the backpack and shot five classmates, killing Zoe Galasso, Gia Soriano and Shaylee Chuckulnaskit, all 14, and Andrew Fryberg, 15. All were shot in the head. 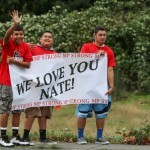 Nate Hatch, 15, was shot in the jaw and spent about two weeks in Seattle’s Harborview Medical Center. The report indicates that Fryberg was angry over a breakup with a girlfriend, as well as a fight he had with a fellow student in the days before the shooting. 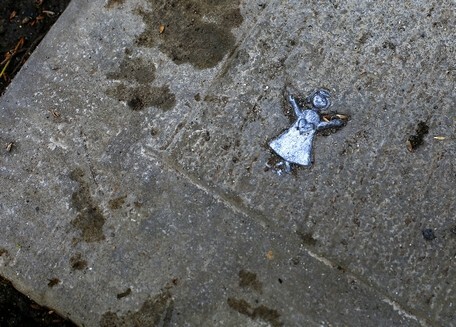 However, the team of investigators said it could not determine a definitive reason for the shooting. SEATTLE – The gun used by Marsyville-Pilchuck High School shooter Jaylen Fryberg to kill four classmates and himself last year was illegally purchased by his father, according to federal court documents. Raymond Lee Fryberg, 42, appeared in federal court Tuesday afternoon on unlawful possession of firearms. Raymond Fryberg was under a permanent protection order from Tulalip Tribal Court after Raymond’s then-girlfriend claimed in 2002 that he had threatened and assaulted her. In 2012, Raymond pleaded no contest after being charged with violating the order and was sentenced to a year of probation. As part of the protection order, Raymond was not allowed to purchase firearms. But the court documents reveal that he purchased five firearms from a Cabela’s store in Tulalip, Wash., between January 2013 and July 2014. When he purchased the guns, he falsely indicated on the purchasing agreement that he was not under a protection order. Investigators at the Marysville-Pilchuck shooting on October 24, 2014, later identified the gun that Jaylen Fryberg used – a Baretta PX4 Storm – as the one of the guns Raymond Fryberg purchased. Jaylen Fryberg, 15, shot and killed his cousin Andrew Fryberg, 15; Gia Soriano, 14; Shaylee Chuckulnaskit, 14; and Zoe Galasso, 14 inside the school cafeteria. Jaylen also wounded 14-year-old Nate Hatch before turning the gun on himself. 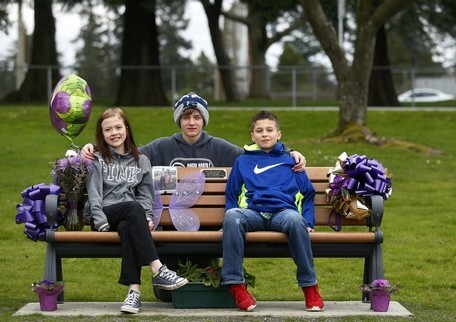 Gia Soriano’s cousins, 11-year-old Gabby (left) and 14-year-old Titan (middle), with Gia’s brother, 11-year-old Anthony Soriano, on a memorial bench Gia’s grandmother, Elaine, had installed in Legion Park in Everett. Gia Soriano was killed in the shooting at Marysville Pilchuck High School last year. The family will celebrate Gia’s birthday at the park on March 31. 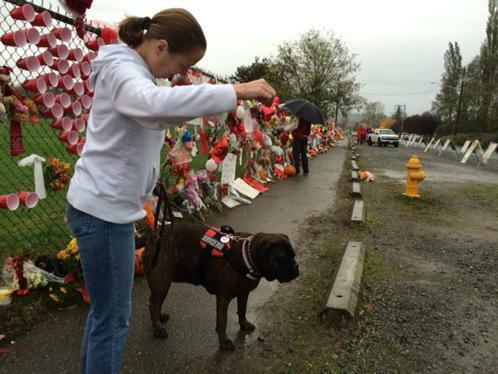 EVERETT — This Tuesday would have been Gia Soriano’s 15th birthday. Her name should be on a learner’s permit. Instead, it’s on a memorial park bench. Gia Christine Soriano was among the four students fatally shot by a classmate in the Marysville Pilchuck High School cafeteria on Oct. 24. She died two days later. A bench was recently installed in her honor in Everett’s Legion Memorial Park, overlooking Port Gardner Bay. It’s a place where her family, her friends and the community can come to remember the sweet girl with the radiant smile. An intimate birthday gathering is planned March 31 at the bench, which sits about 100 feet from Gia’s paternal grandparents’ home bordering the park. She ordered the bench from Everett Parks and Recreation Department and paid the $3,500 herself. Donations reimbursed her the cost. Many of Gia’s close relatives live in Everett, where the family has strong ties. The bench is a bittersweet monument. 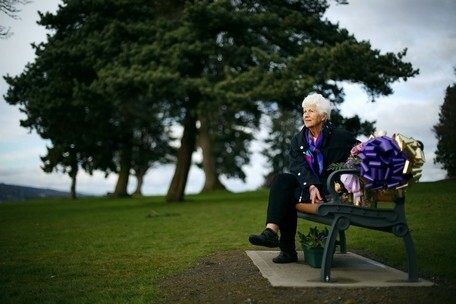 Elaine Soriano worked with Everett Parks & Recreation to install a memorial bench for her granddaughter Gia Soriano at Legion Memorial Park in Everett. The park is a calm spot with a backdrop of sparkling waves and multicolored skies. The bench looks festive, with big shiny bows and colorful flowers. It contrasts with the aching void that family members face trying to cope with the loss of Gia and the violent way her life was taken from them. “Everything is different now,” said Gia’s mom. Gabby sees a grief counselor and speaks openly about her anguish and anger. After the photo session on the bench, Titan and Gia’s brother, Anthony, 11, raced around the park and climbed a tree. Gabby soon joined them, wearing Gia’s gray “PINK” sweatshirt. Gia’s gravesite is in Evergreen Cemetery. Elaine Soriano and her husband, John, a retired longshoreman, moved to the house adjacent to the park 25 years ago. They wanted a place for the generations to gather. It didn’t get better than having a park right outside the door to play and picnic. Gia’s dad, Bryan, is the youngest of the couple’s six children. All graduated from Everett High School, as did Elaine and John. “Giovanni” is John’s birth name, but he got it legally changed when he was 12 for something less Italian and more mainstream. There are other memorial benches in the park, but Gia’s is closest to their home. Elaine Soriano laments it was supposed to be her name on the bench, not her granddaughter’s. “I always told my children I would like a bench in the park,” she said. It’s in plain view from her living room. She keeps tabs on who’s visiting the bench and freshens the flowers. When she’s not home, an angel statue faces out the window to keep watch. The house is a shrine to Gia, with pillows and ribbons in purple, the teen’s favorite color, and numerous photos of her stages of life. A favorite is of Gia in her dress at the homecoming dance days before the shooting. “We have 15 grandchildren,” Elaine Soriano said. She includes Gia in the count. Gia’s childhood drawings and Baptismal dress hang along the hallway. She is ever-present. The park bench on Alverson Boulevard is about a mile from Providence Regional Medical Center Everett where Gia was rushed after the shooting that ended hers and the other young lives at the lunch table that day. Zoe Galasso, 14, Andrew Fryberg, 15, and Shaylee Chuckulnaskit, 14, also died, as did the shooter, 15-year-old Jaylen Fryberg, who killed himself. 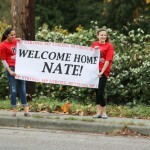 Nate Hatch, 15, is the only survivor. All the victims were shot in the head. “There was nothing they could do. We knew that from day one. They gave it to us straight up,” Gia’s father said. During their bedside vigil at Providence, her mother showed Everett neurosurgeon Dr. Sanford Wright Gia’s school homecoming photo. The parents praise the medical team. “We couldn’t have been in a better place. I’m glad we didn’t end up down in Seattle,” Bryan Soriano said. “The reason we kept her alive for a few more days was for her organs. We’re glad we donated the organs because we got a letter that was just beautiful. It told us where all her organs went. It didn’t say who, their names, it just said their gender and age and what they received. Her liver. Her kidney. Her lungs. A 10-year-old got her corneas, so he can see now. A scholarship at Everett High School has been established in memory of Gia Soriano and Zoe Galasso, two students killed Oct. 24 in the Marysville Pilchuck High School shootings. The Friends of Peace Scholarship was created by friends and former teachers in honor of the students’ parents, Bryan and Susan Soriano and Michael and Michelle Galasso. The Sorianos and Michelle Galasso are alumni of Everett High. The scholarship will be granted to an Everett High graduating senior who has overcome a traumatic life experience and who is interested in pursuing more education after high school. The scholarship will be managed by the Everett Public Schools Foundations. Donations may be sent to Everett Public Schools Foundation, P.O. Box 3112, Everett, WA 98213 or online at epsfoundation.org, referencing the Friends of Peace Scholarship. For more information, send email to jlevin@everettsd.org or call 425-385-4693. “I love you too much to let you hurt yourself,” Robert Macy, a psychologist who works international trauma relief, said as he talked to the Tulalip tribal community about how to interrupt the thoughts of a youth who is considering killing themselves. Macy, who is president of the International Trauma Center in Boston, met Thursday, December 4 with tribal member families, tribal staff and staff from area schools, to share techniques of traumatic incident stress interventions. Macy and a team of 100 specialists have worked in communities worldwide after natural disasters, terrorist acts and violent events. 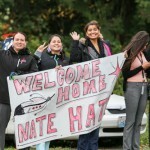 Any effort to bring healing to the trauma that the Tulalip community feels will be built upon a combination of “Western medical practice, international tribal techniques for healing, and Tulalip’s own creativity and ingenuity,” Macy said. At Macy’s request, no names or direct quotes from those who participated in sessions on Thursday will be shared in this article. Macy made this request out of concern that tribal members and staff be able to speak freely about their concerns in a confidential setting. Instead, the focus of this article is on Macy’s techniques for treating youth in trauma and helping communities with a history of trauma. Your body’s emergency response to a threat is a good thing when there is a threat, but it’s a problem when the danger is gone and the child or adult can’t calm down to go to sleep or go to school or work. This is a sign that the nervous system is flooded with chemicals that keep you on edge and don’t let you calm down. In this state of trauma, a fishnet, speaking figuratively, must be unfurled to catch every youth and every child who is reeling from the unexplainable and unimaginable events of the past weeks, or the past months and years when other violent traumatic events impacted the tribal community. To do this, Macy’s groups works with the community to create and train teams of community members, “from the bus driver to the bartender,” and from the mental health staff to the parents, to intervene with kids and cope with conversation. With youth who are considering suicide, Macy said, “They are thinking, ‘I am dirty and disgusting. The world will be a better place without me.’” Amid those thoughts, suicide might seem to be the only option for some. The intervention is that there are more options. At the same time, Macy advised that the Tulalip community agree and communicate that suicide is not only a bad choice, but it is also a taboo that is unacceptable in this community, he said. For parents and trusted adults, he said it is important to find out what your kid really cares about, what matters the most to them. To do this requires the adult to come to a non-judgmental place of compassion and calm, because what the kid shares might be revolting to you. But finding this out will make a bridge that will help you reach your child, he said. Some youth may need hospitalization, some may need medicine, and many others simply need outpatient counseling, programs and community engagement. The good news is that trauma is highly treatable as long as it isn’t suppressed and silenced. “Trauma that is silenced will end in violence,” Macy said. 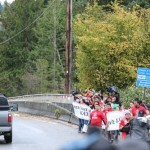 No decisions have been made by the Tulalip Tribes about what the next steps will be. Macy said the important thing is to look at the strengths the Tulalip community has, including the resiliency of the Tulalip ancestors, the loving tribal children and parents, and the Tulalip community that is committed to finding a path to healing. The Tulalip Tribes’ Behavioral Health Family Services has worked tirelessly since the tragic shooting on Oct. 24 to provide mental wellness to anyone in the tribal community who needs help. Behavioral Health also knows that in crisis, people need help around the clock. Here is a list of the phone numbers with descriptions about the focus of each crisis line. On the Tulalip Reservation and in Marysville, our 9-1-1 calls are answered by SNOPAC, a regional public safety communications center that receives law enforcement, fire and medical 9-1-1 calls for 37 different Snohomish County jurisdictions. It’s staff of “highly trained and dedicated professionals are available 24x7x365,” as stated on SNOPAC’s website. SNOPAC’s Core Values are Integrity, Respect, Professionalism and Teamwork. Learn more at http://www.snopac911.us/. The Snohomish County Crisis Line connects callers with a mental health clinician, who will provide emotional support and crisis intervention to individuals in crisis or considering suicide. In addition to the 24 Hour Crisis Line, an online chat also offers crisis services through Care Crisis Chat for those who prefer to access care via the Internet. Learn more at http://www.voaww.org/Get-Help/Behavioral-Health-Services – sthash.uKHLCR79.dpuf. The Crisis TEXT Line, http://www.crisistextline.org/get-help-now/, states, “Millions of teens are quietly suffering every day. They struggle with bullying, homophobia, suicidal thoughts and more. The solution is beautifully simple: We provide crisis intervention services to teens via a medium they already use and trust: text. And we use insights from our work to develop and share innovations in prevention, treatment, and long-term care.” It is a program of DoSomething.org, one of the largest non-profit organizations for young people and social change. Based in King County, the Crisis Line provides crisis assistance. “We need to talk with you directly on the phone. By talking with you anonymously and confidentially, we are best able to work with you to find help,” the Crisis Line states on its website, http://crisisclinic.org. TULALIP, Wash – The holidays will be different at the Tulalip Tribes this year. Gratitude, an important part of any holiday season, is made more important because of the losses that have occurred since the Oct. 24 shooting at Marysville Pilchuck High School. For children who seek care or are referred at the center, the recent events are raising questions as big as life and death, and wonders about how we will ever celebrate this holiday season without in a time of trauma and grief. For families, Gurjeet Sidhu, a child therapist at the center, the most important thing that parents can do now for their children is to listen to them. “Knowing where your child is can let you know if they are internalizing the tragedy negatively,” Sidhu said. This could mean that child is wondering if they had prayed harder, of if they had checked on someone more, or could they have been nicer if they had only known this one or that one would be gone. In this season when every news flash potentially triggers more traumas in our community, the act of listening and hearing even a child’s non-verbal communication will be the best gift that parents and trusted adults can give. And as children turn their attention to the holidays, the question that arises is, will it be the same this year? Sidhu recommends, responding with a question, “What do you think?” Then listen. For younger kids, who still believe that Santa Claus will come and make everything right, parents need to be stronger and protect the magical thinking while the child still has it because, because, Sidhu said, we will all get to be adults soon enough. “Personally, if your family has holiday rituals like gathering around the holiday dinner table keep that going so you keep the traumatic memory from attaching to the holiday,” Sidhu said. The holiday traditions have a rhythm that can help keep everyone in the family engaged in the holiday even in hard times like these. You might not feel like it, but once you start decorating, baking cookies or whatever your tradition, the familiar activities will inspire you and your children. 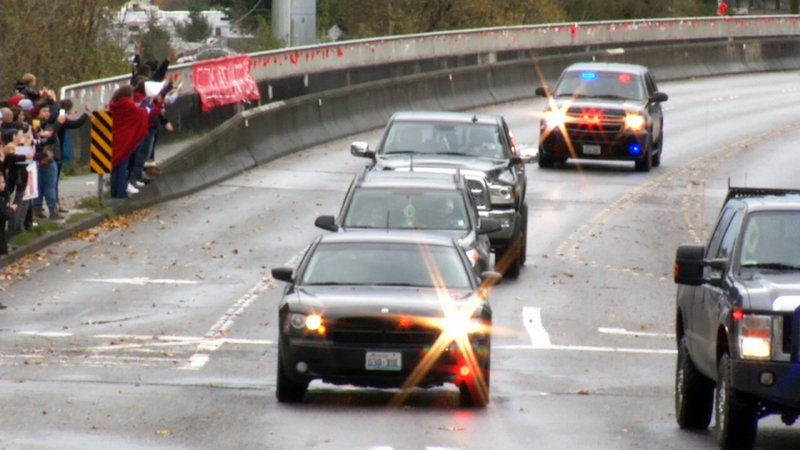 At a banquet that the Tulalip Tribes held last month for the first responders to the tragedy, Goldsmith heard people talk about the new normal now that these recent events have entered the history of the Tribes. The young ones us are asking questions about how can they help the people around them, even as they are experiencing loss in a deeper way than maybe they ever have before. Some children have shared with Sidhu that they cried two hours straight for everything that ever went bad, while others are feeling things that have happened even recently more deeply. 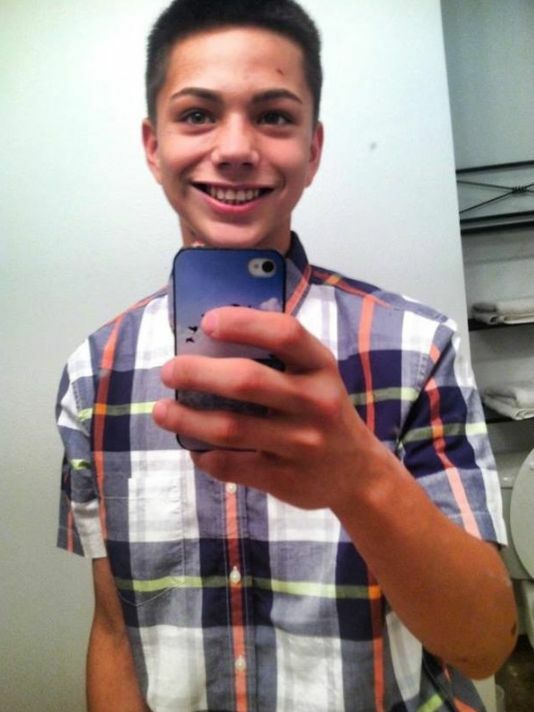 Moments before Jaylen Fryberg, 15, shot his fellow students Oct. 24 in the Marysville Pilchuck High School cafeteria, he texted more than a dozen relatives, describing what he wanted to wear at his funeral and who should get his personal possessions, the detective’s search warrant affidavit says. The boy asked relatives to apologize to the families of his friends “who get caught up in the (expletive) tomorrow” – referring to the day after the shooting. He also sent texts in the previous days to a female friend talking about his death and funeral. The popular teen fatally shot four friends he had invited to lunch and wounded a fifth teen before killing himself. The victims are Gia Soriano, Zoe Galasso and Shaylee Chuckulnaskit, all 14, and Andrew Fryberg, 15. All were shot in the head. Nate Hatch, 14, was shot in the jaw and is recovering. Andrew Fryberg and Hatch are the shooter’s cousins. Investigators have found no evidence to support a rumor that students had expressed concerns about Jaylen Fryberg to school authorities before the shooting, police spokeswoman Shari Ireton said Wednesday. The Daily Herald of Everett obtained the Everett police detective’s affidavit, which provided details of the boy’s last text messages, but not their full contents. 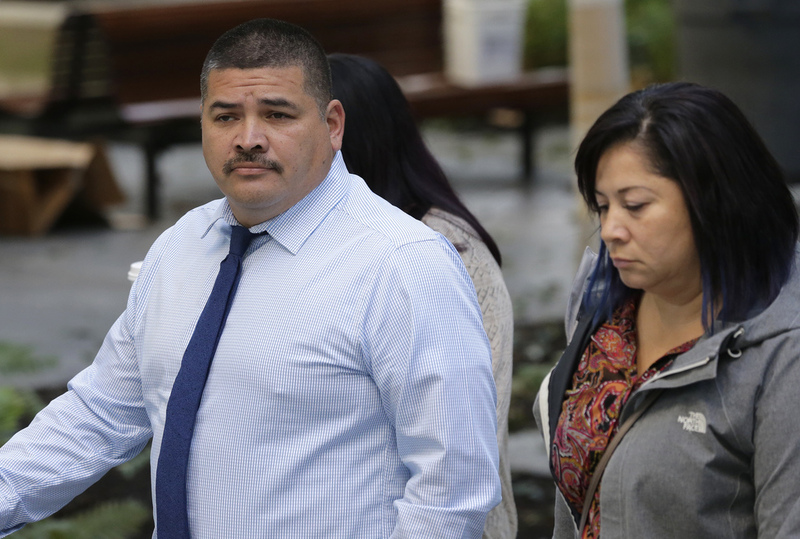 The detective had been seeking a judge’s permission to examine the boy’s cellphone. Multiple agencies are investigating the shooting and are sifting through hundreds of text messages and social media posts. While the boy had publicly posted some angry messages on social media starting in late July, his posts otherwise were “pretty normal,” the detective wrote. The change began Oct. 18. Investigators know what happened between the two but decided against including specifics in the search warrant documents to protect her identity, court papers said. That message was sent minutes before the shooting started. Detectives later searched the boy’s room. “Unfortunately, Andrew Fryberg, 15, passed away this evening, November 7, at Harborview Medical Center,” Harborview officials said in a released statement. “We express our thanks for the amazing support from the community, as well as from everyone around the world that have been praying for us all through this tragic event. We also want to say a special thank you to all the amazing staff that have cared for our son and brother here in the pediatric intensive care unit at Harborview. Our family is overwhelmed with the love and care that has been provided to our loved one during this time and you all will forever hold a special place in our hearts. 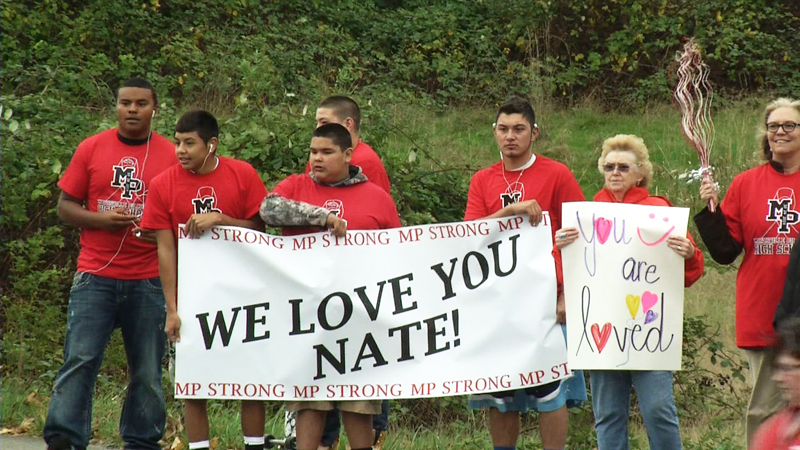 Fryberg’s passing brings the death toll in the Marysville-Pilchuck High School shooting to five. Gia Soriano, 14, and Shaylee Chuckulnaskit, 14, died after suffering critical head injuries in the shooting. Zoe Galasso, 14, died at the school after she was shot in the head. 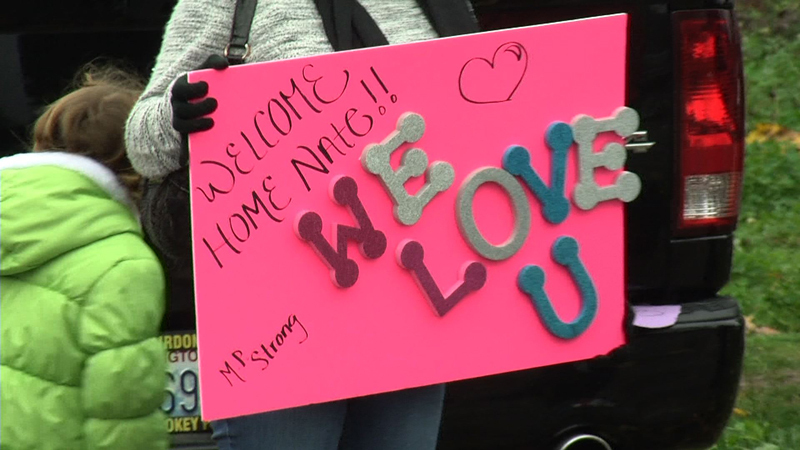 TULALIP, Wash – Nate Hatch, one of the Marysville Pilchuck High School shooting victims, was released from Harborview Medical Center today and returned home to the Tulalip Indian Reservation to a large crowd of family and friends cheering him on. 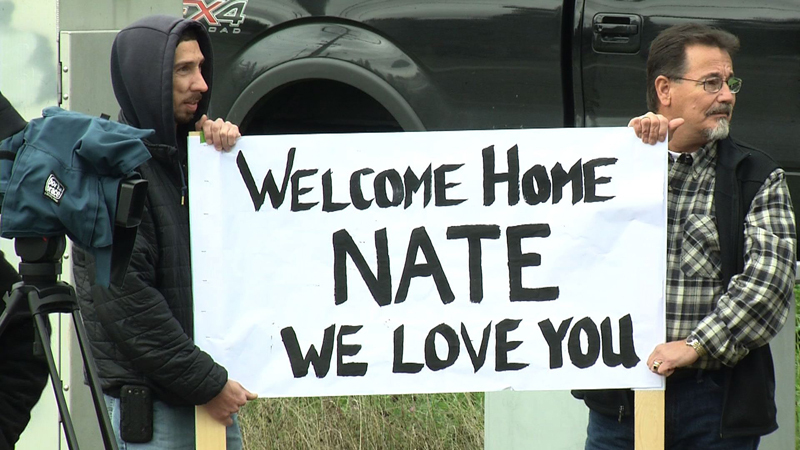 Amidst signs and banners in support of Nate, people were smiling, waving and hugging. 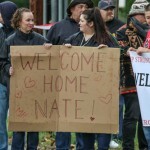 Nate had been shot in the jaw and has been hospitalized since the October 24th shooting. 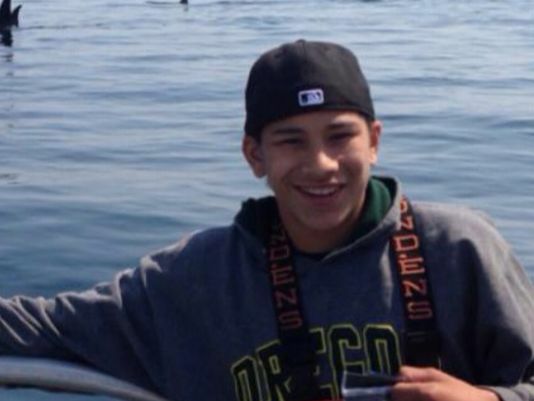 Andrew Fryberg remains in critical condition at Harborview. Jaylen Fryberg opened fire on five classmates before killing himself. Three of those victims, Gia Soriano, Zoe Galasso and Shaylee Chuckulnaskit were fatally wounded. 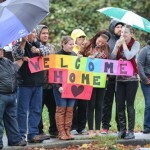 Hundreds of people cheering, holding candles and flashing heart signs lined the road leading to a shooting-scarred Washington state high school Monday morning, delivering an uplifting welcome to students searching for normalcy. The buses rolled up to Marysville Pilchuck High School 10 days after freshman Jaylen Fryberg invited friends to sit with him at lunch and then shot five of them — mortally wounding three — before committing suicide. Three hundred to 400 alumni and 50 to 80 police officers greeted the students in the gymnasium as they came off buses, said Rob Lowry, the school’s co-principal. “The first thing they noticed was there were lines of first responders there,” Lowry said — a decision intended to send a message of security and safety. And it wasn’t just the students who came together. 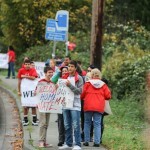 Residents flocked to the school with signs that read, “We stand with you,” and chanted “Tomahawk!” — the school’s athletic nickname. A U.S. flag was hung over the road from a fire truck, and parents and alumni decorated the outside school walls with signs of welcome. After days of tearful gatherings and vigils, many students on buses wore smiles as they watched supporters make heart signs with their hands. Some of the teens flashed the same sign back. There were no classes. Instead, students attended an assembly and then milled around. The cafeteria was closed, its eventual fate up to the school district. “It was eerie looking at the cafeteria but good to come together,” Miles said. At the end of the day, some of the students stopped to look at a fence that has been turned into a memorial for the victims: Shaylee Chuckulnaskit, Zoe Galasso and Gia Soriano, the 14-year-olds who were killed, and Nate Hatch, 14, and Andrew Fryberg, 15, who remain hospitalized. 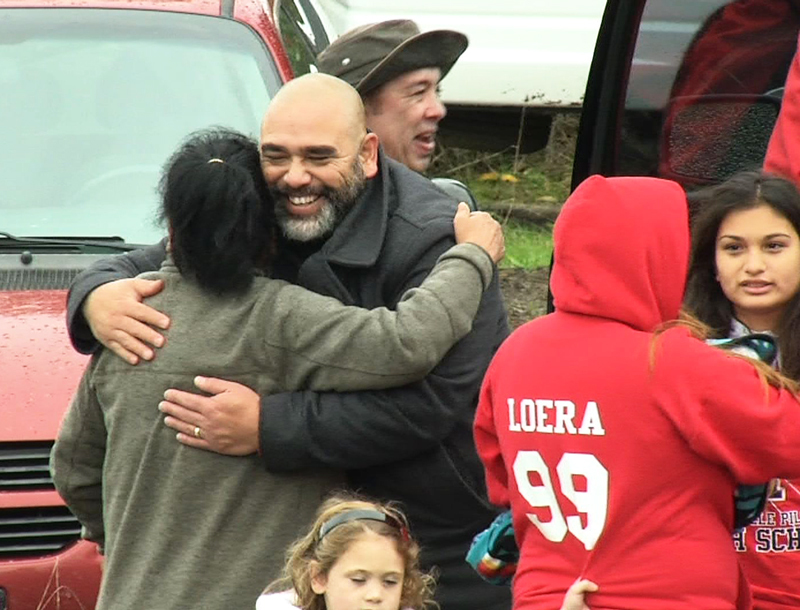 Police still haven’t revealed what motivated Fryberg to ambush the teens, two of whom were his cousins. The shooter was popular and had recently been voted the school’s “homecoming prince,” and many students were friends with both him and the victims. Fryberg was a member of the Tulalip Tribes, which said it had been targeted by threats that had some kids fearful to return to school. Keith Red Elk, whose daughter Jessica is a senior, said he hoped the turnout would help the kids face their fears. “We are here to show them it is OK to come back,” he said. Deborah Parker, a member of the tribal council whose son is a senior at the school, said: “I drove my son to school, and he seemed to be a little bit nervous, but we worked hard as a family to watch over him. 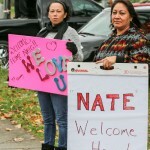 Afterward, representatives of Sandy Hook Elementary School in Newtown, Connecticut — where a gunman killed 20 pupils and six staff members in 2012 — passed on to the school district and to the Tulalip Tribes a Native American dreamcatcher plaque that it received from Columbine High School, the scene of a similar massacre in Littleton, Colorado, in 1999. 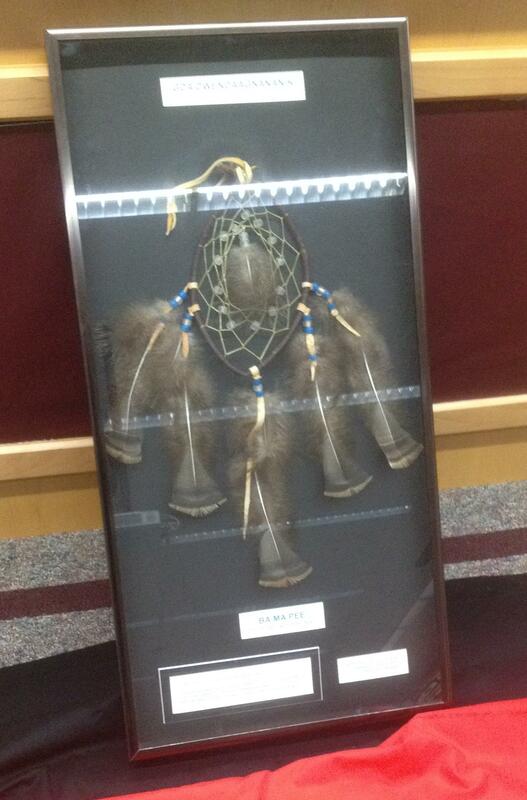 Representativs from Sandy Hook Elementary School in Newtown, Connecticut, passed on a memorial Native American dreamcatcher plaque to the Marysville School District on Monday. “It is our hope that you should never have to pass it on,” Smith said.